“I fully expected to find a place where survival depends on the whims of the ocean, where the line between hungry and full rests on what you can hunt and gather,” wrote photographer David Hu ’16 in a progress report during his stay with the Bajau of Sampela, a seafaring community off the coast of Kaledupa Island in southeastern Indonesia. In the spring and summer of 2017, Hu lived with Bajau who are one of the last remaining communities of an ocean-faring people—sea nomads, or sea gypsies, they are still sometimes called—whose way of life stretches back hundreds of years. And in this century, it is increasingly threatened. At one time, the Bajau were fully nomadic, roaming parts of Indonesia, Malaysia, and the Philippines and living in dugout houseboats, called lepa lepa, made from teak. 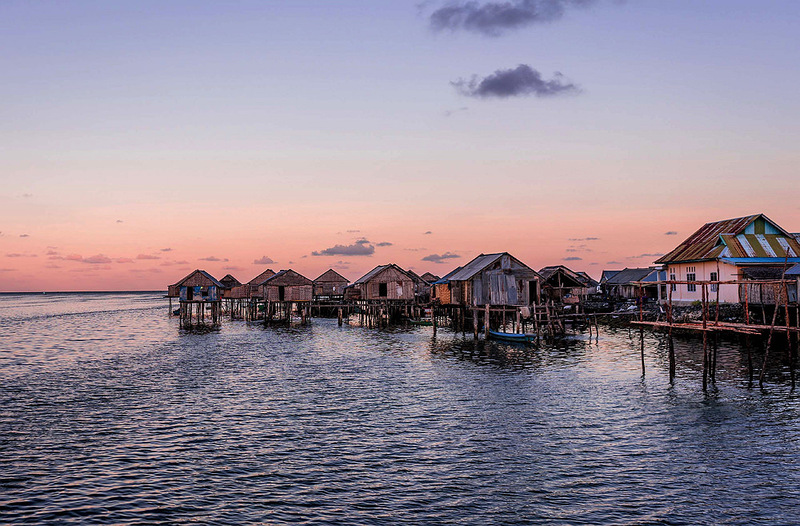 A few still do, but most Bajau, including those in Sampela, a village of about 1,000 people, now live in huts built on stilts that stand a few hundred yards from land, connected to each other by a series of piers and walkways. Depending on the tides and the time of year, the water beneath the village’s homes can be anywhere from several inches to about eight feet deep. Hu is a photographer and a scientist whose work in both fields has taken him to remote corners of the world. At Harvard, he concentrated in organismic and evolutionary biology and volunteered as an EMT; his long-term plans include medical school and a career as a physician. (He currently researches craniofacial development in associate professor Eric Liao’s plastic surgery laboratory at Massachusetts General Hospital.) But, Hu says, “I have always loved photography.” He first picked up a camera as a teenager and got serious about it a couple of years ago. He has traveled to Rwanda to research the country’s trauma and prehospital care, and to photograph its mountain gorillas: arresting, sensitive portraits of endangered animals. In the Congo he and his camera shadowed local porters hired to carry trekkers’ gear up to the summit of Mount Nyiragongo, an active volcano. Last February, he accompanied research fellows from Massachusetts General Hospital’s wilderness medicine division to Nepal, where he helped gather data on altitude illness and photographed people in the Himalayas (see “Medicine in the Middle of Nowhere,”  November-December 2017, page 43). Closer to home, Hu has chronicled the ice-climbing exploits of the Harvard Mountaineering Club, of which he was also a member. A Bajau elder navigates the shallows surrounding the village to gather urchins and conchs to eat or sell. Most residents still use manual or sailing canoes, like the woman cleaning and charring the hull of her hand-built canoe. Several men fix a broken electrical cable by matchlight during a monsoon storm—an improvised repair to a previous improvised repair. As these men worked, the lights of the nearest house, and of the other houses connected to it, flickered on and off every time the two bare wires—each containing 240 volts—touched. Satellite TV dishes have begun appearing outside Sampela homes, a marker of some residents' wealth and the increasing presence of technology. A young woman harvests food—octopuses, urchins, conchs, sea cucumbers—at low tide near Sampela. Although spearfishing is most traditional, some Bajau fishermen also use other methods. With a lure made from a plastic bag, two men go longlining for houndfish. Some Bajau communities are still fully nomadic and live year-round in lepa lepa houseboats. Sampela residents use these boats for long journeys to distant fishing grounds and to travel to other Bajau communities in Malaysia and Indonesia. Using a homemade speargun and wooden goggles, an older man hunts for triggerfish in the reef. During days-long fishing trips, recalls photographer David Hu, all meals are fish. "You'd shoot a fish, get back on the boat, clean it—though you don't even really gut it—you just cut pieces off and eat it raw. Then go back for more fish." Reef damage from dynamite fishing often means that Bajau fishermen must dive deeper and longer to find fish. But there are new pressures. Climate change brings stronger and more frequent storms—Hu recalls whole days spent sitting inside his hosts’ home, listening to the wind and rain, waiting for the weather to pass so they could fish again. “In the weeks that I have been here,” he wrote in his late May progress report, “the number of days with storms strong enough to shake my stilted cabin have far outnumbered days of calm and sun.” The number of fish available has also declined sharply in recent years. Overfishing is part of the problem, but dynamite and cyanide fishing in the Sampela area—practices now banned, though the bans are not always enforced—have also taken a toll. “In some places, you would dive down into the water and find these massive craters in the coral from years back,” says Hu, who first learned freediving as a teenager in Florida and went fishing most days with the Bajau men. The scarcity of fish, he says, drives spear fishermen deeper and deeper in search of large enough fish to catch, risking stronger ocean currents and blackouts from a lack of oxygen.